Paper by Hanna C Norberg: “Blockchain technology is still in its infancy, but already it has begun to revolutionize global trade. Its lure is irresistible because of the simplicity with which it can replace the standard methods of documentation, smooth out logistics, increase transparency, speed up transactions, and ameliorate the planning and tracking of trade. Blockchain essentially provides the supply chain with an unalterable ledger of verified transactions, and thus enables trust every step of the way through the trade process. Every stakeholder involved in that process – from producer to warehouse worker to shipper to financial institution to recipient at the final destination – can trust that the information contained in that indelible ledger is accurate. Fraud will no longer be an issue, middlemen can be eliminated, shipments tracked, quality control maintained to highest standards and consumers can make decisions based on more than the price. Blockchain dramatically reduces the amount of paperwork involved, along with the myriad of agents typically involved in the process, all of this resulting in soaring efficiencies. Making the most of this new technology, however, requires solid policy. Most people have only a vague idea of what blockchain is. There needs to be a basic understanding of what blockchain can and can’t do, and how it works in the economy and in trade. Once they become familiar with the technology, policy-makers must move on to thinking about what technological issues could be mitigated, solved or improved. Governments need to explore blockchain’s potential through its use in public-sector projects that demonstrate its workings, its potential and its inevitable limitations. Although blockchain is not nearly as evolved now as the internet was in 2005, co-operation among all stakeholders on issues like taxonomy or policy guides on basic principles is crucial. Those stakeholders include government, industry, academia and civil society. All this must be done while keeping in mind the global nature of blockchain and that blockchain regulations need to be made in synch with regulations on other issues are adjacent to the technology, such as electronic signatures. However, work can be done in the global arena through international initiatives and organizations such as the ISO….(More)”. Report by Giulio Coppi and Larissa Fast at ODI (Overseas Development Institute): “Blockchain and the wider category of distributed ledger technologies (DLTs) promise a more transparent, accountable, efficient and secure way of exchanging decentralised stores of information that are independently updated, automatically replicated and immutable. The key components of DLTs include shared recordkeeping, multi-party consensus, independent validation, tamper evidence and tamper resistance. Building on these claims, proponents suggest DLTs can address common problems of non-profit organisations and NGOs, such as transparency, efficiency, scale and sustainability. Current humanitarian uses of DLT, illustrated in this report, include financial inclusion, land titling, remittances, improving the transparency of donations, reducing fraud, tracking support to beneficiaries from multiple sources, transforming governance systems, micro-insurance, cross-border transfers, cash programming, grant management and organisational governance. This report, commissioned by the Global Alliance for Humanitarian Innovation (GAHI), examines current DLT uses by the humanitarian sector to outline lessons for the project, policy and system levels. It offers recommendations to address the challenges that must be overcome before DLTs can be ethically, safely, appropriately and effectively scaled in humanitarian contexts….(More)”. Blog Post by Ivan Ivanitskiy: “People are resorting to blockchain for all kinds of reasons these days. Ever since I started doing smart contract security audits in mid-2017, I’ve seen it all. A special category of cases is ‘blockchain use’ that seems logical and beneficial, but actually contains a problem that then spreads from one startup to another. I am going to give some examples of such problems and ineffective solutions so that you (developer/customer/investor) know what to do when somebody offers you to use blockchain this way. Let’s say you ordered some goods, and a carrier guarantees to maintain certain transportation conditions, such as keeping your goods cold. A proposed solution is to install a sensor in a truck that will monitor fridge temperature and regularly transmit the data to the blockchain. This way, you can make sure that the promised conditions are met along the entire route. The problem here is not blockchain, but rather sensor, related. Being part of the physical world, the sensor is easy to fool. For example, a malicious carrier might only cool down a small fridge inside the truck in which they put the sensor, while leaving the goods in the non-refrigerated section of the truck to save costs. Blockchain is not Internet of Things (IOT). We will return to this statement a few more times. Even though blockchain does not allow for modification of data, it cannot ensure such data is correct.The only exception is on-chain transactions, when the system does not need the real world, with all necessary information already being within the blockchain, thus allowing the system to verify data (e.g. that an address has enough funds to proceed with a transaction). Applications that submit information to a blockchain from the outside are called “oracles” (see article ‘Oracles, or Why Smart Contracts Haven’t Changed the World Yet?’ by Alexander Drygin). Until a solution to the problem with oracles is found, any attempt at blockchain-based supply chain management, like the case above, is as pointless as trying to design a plane without first developing a reliable engine. Even though this case is similar to the previous one, I would like to single it out as it is presented in a different wrapper. Say we make unique and expensive goods, such as watches, wines, or cars. We want our customers to be absolutely sure they are buying something made by us, so we link our wine bottle to a token supported by blockchain and put a QR code on it. Now, every step of the way (from manufacturer, to carrier, to store, to customer) is confirmed by a separate blockchain transaction and the customer can track their bottle online. Paper by Alvaro Gonzalez Rivas, Mariya Tsyganova and Eliza Mik: “Many expect Smart Contracts (SC’s) to disrupt the way contracts are done implying that SC have the potential to affect all commercial relationships. SC’s are automatization tools; therefore, proponents claim that SC’s can reduce transaction costs through disintermediation and risk reduction. This is an over-simplification of the role of relationships, contract law, and risk. We believe there is a gap in the understanding of the capabilities of SC’s. With that in mind we seek to define an amorphous term and clarify the capabilities of SC’s, intending to facilitate future SC research. We’ve examined the legal, technical, and IS views from an academic and practitioner’s perspective. We conclude that SC’s have taken many forms, becoming a suitcase word for any sort of code stored on a blockchain, including the embodiment of contractual terms; and that the immutable nature of SC’s is a barrier to their adoption in uncertain and multi-contextual environments….(More)”. NBER Working Paper by Joseph Abadi and Markus Brunnermeier: “When is record-keeping better arranged through a blockchain than through a traditional centralized intermediary? The ideal qualities of any record-keeping system are (i) correctness, (ii) decentralization, and (iii) cost efficiency. 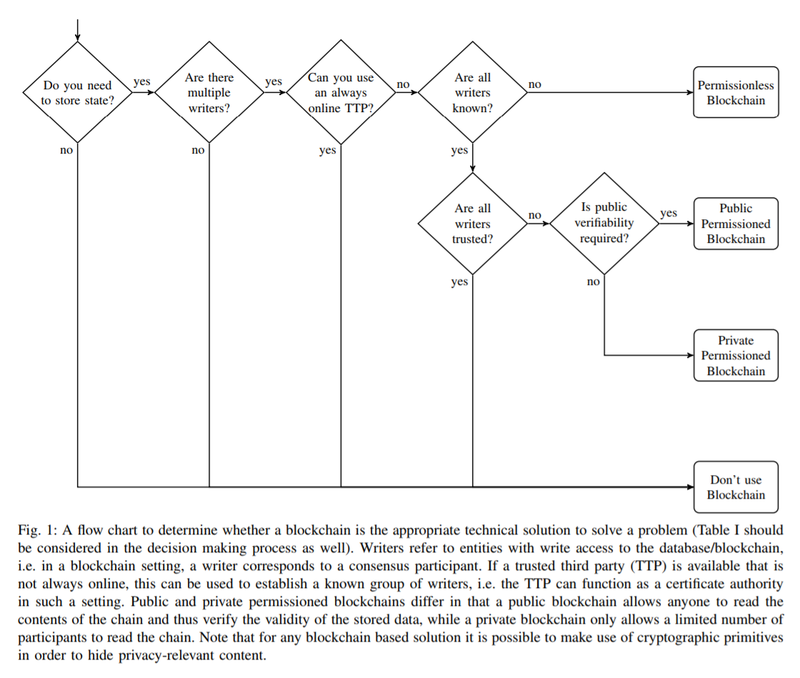 We point out a blockchain trilemma: no ledger can satisfy all three properties simultaneously. Mike Orcutt at Technology Review: “China’s crackdown on blockchain technology has taken another step: the country’s internet censorship agency has just approved new regulations aimed at blockchain companies. Hand over the data: The Cyberspace Administration of China (CAC) will require any “entities or nodes” that provide “blockchain information services” to collect users’ real names and national ID or telephone numbers, and allow government officials to access that data. It will ban companies from using blockchain technology to “produce, duplicate, publish, or disseminate” any content that Chinese law prohibits. Last year, internet users evaded censors by recording the content of two banned articles on the Ethereum blockchain. The rules, first proposed in October, will go into effect next month. Defeating the purpose? For more than a year, China has been cracking down on cryptocurrency trading and its surrounding industry while also singing the praises of blockchain. It appears its goal is to take advantage of the resiliency and tamper-proof nature of blockchains while canceling out their most most radical attribute: censorship resistance….(More)”. Report by Matt Higginson, Marie-Claude Nadeau, and Kausik Rajgopal: “Blockchain has yet to become the game-changer some expected. A key to finding the value is to apply the technology only when it is the simplest solution available. Amid intense experimentation, industries from financial services to healthcare and the arts have identified more than 100 blockchain use cases. These range from new land registries, to KYC applications and smart contracts that enable actions from product processing to share trading. The most impressive results have seen blockchains used to store information, cut out intermediaries, and enable greater coordination between companies, for example in relation to data standards…. Cathy Mulligan in the UN Chronicle: “…What can blockchain give us, then? Blockchain is still new and will evolve many times before it can be fully integrated into society. We have seen similar trajectories before in the technology industry; examples include the Internet of things, mobile telephony and even the Internet itself. Every one of those technologies went through various iterations before it was fully integrated and used within society. Many technical, social and political obstacles had to be slowly but surely overcome. It is often useful, therefore, to approach emerging technologies with some depth of thought—not by expecting them to act immediately as a fully functional solution but rather as a lens on the possible. Such an approach allows for a broader discussion, one in which we can challenge our preconceived notions. Blockchain has already illustrated the power of individuals connected via the Internet with sufficient computing power at their disposal. Far from merely tweeting, taking and sharing photos or videos, such people can also create an entirely new economic structure. The power of blockchain thus lies not in the technology itself but rather in how it has reframed many discussions across various parts of our society and economy. Blockchain shows us that there are options, that we can organize society differently. It has launched 1,000 different thought experiments but the resulting solutions, which will be delivered a decade or two from now, may or may not be based on blockchain or cryptocurrencies. The discussions that started from this point, however, will have been important contributions to the progress that society makes around digital technologies and what they can mean for humankind. For these reasons, it is important that everyone, including the United Nations, engage with these technologies to understand and learn from them. At its most basic level, blockchain speaks to a deep, human need, one of being able to trust other people, organizations and companies in a world where most of our interactions are mediated and stored digitally. It is arguable how well it captures that notion of trust, or whether any technology can ever actually replicate what a human being thinks, feels and acts like when they trust and are trusted. These concepts are deeply human, as are the power structures within which digital solutions are built. Blockchain is often discussed as removing intermediaries or creating democratic solutions to problems, but it may merely replace existing analogue power structures with digital ones, and cause decision-making within such contexts to become more brutally binary. ‘Truth’ on the blockchain does not leave room for interpretation, as today’s systems do. Context is critical for the development of any technology, as is the political economy within which it exists. Those who have tried to use blockchain, however, have quickly realized something: it forces a new level of cooperation. It requires partnerships and deep discussions of what transparency and inclusion truly look like…. Perhaps one of the reasons that blockchain has received so much attention is because it speaks to something that many people across the world are feeling instinctively: that we can only create new solutions to some of the world’s oldest problems by working together and including everyone in the discussion. Blockchain appeals to many people as a viable solution precisely because it is about applying a counter-intuitive approach to problems; despite the often technology-deterministic manner in which it is discussed, it is important to listen to the underlying message. The call to inclusion, trust and multilateralism that blockchain attempts to address from a technical perspective is one that will continue for many decades to come and one to which we must find new ways to respond via Governments, civil society, academia, non-governmental organizations and international organizations such as the United Nations….(More)”. Springwise: “…Blockchain has also lead to huge steps forward in this sector, enabling greater transparency for consumers in the food industry. This latest innovation could also combine both worlds in using blockchain to take back control of personal data. Gravity Earth seeks to provide equal access and opportunity to digital IDs, a growing necessity in the modern world. Digital identities allow access to key financial services, mobile communication, and other online benefits. At the moment, Gravity Earth estimates that around 1.5 billion people across the globe do not have an official proof of identity. The Nairobi-based startup sought to change this by allowing anyone to create a secure, self-sovereign digital ID based on their personal data. The blockchain-based process can be done wherever you are and on any mobile device. Their solution allows currently disadvantaged people to store and share personal data with whoever they want. In so doing, it also allows users to build on existing traditional IDs, but does not depend on them.